Come shop and order some great ASNC swag! New 25th anniversary products are also available for purchase! Show off your ASNC pride with these new silver anniversary lapel pins! 7/8â€� wide die struck metal lapel pin with military clutch. Sandblasted polished imitation rhodium plated finish. 25th ASNC logo. 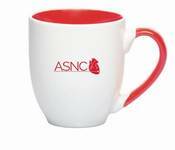 Please note: Shipping included for current ASNC members in the continental U.S., international shipping not included (varies by product and country). ASNC uses the United States Postal Service "2 day" when shipping out items. 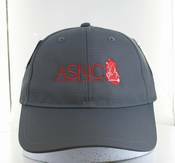 No returns, or refunds For an inquires, contact info@asnc.org 10% of all proceeds will go to the Institute for the Advancement of Nuclear Cardiology (IANC), which funds our research grant awards program. Wide, large ceramic coffee mug. This new coffee mug is big enough for soup or coffee! 10% of all proceeds will go to the Institute for the Advancement of Nuclear Cardiology (IANC), which funds our research grant awards program.